Amid clanging construction equipment, debris from building materials, and the sight of rapidly rising concrete and steel frames, the area north of New Haven’s Grove Street Cemetery has caught the attention and interest of many in the city. For anyone that has spent time in the area within the last 30 years, whether as a Dixwell neighborhood resident, Yale student or employee, or an occasional passerby, the University’s recent building efforts have resulted in dramatic changes to this corner of New Haven – culminating with the construction of two new residential colleges designed in a Collegiate Gothic style by the firm of Robert AM Stern, dean of the Yale School of Architecture from 1998 to 2016. To understand what these changes mean for both the City and the University requires a closer look at the cultivation of not only the land north of the Grove Street Cemetery, but also the building types deployed across Yale’s campus. This first installment in a three part series explores the University’s strategies for connecting its campus across the Cemetery and up to Science Park while also buffering an important development site from New Haven’s Dixwell neighborhood. For the first one hundred years after the New Haven Colony’s founding in 1638, town life existed, for the most part, within the Nine Squares. Serving as the main streets for the small 18th century village of a few thousand residents, present-day George and State Streets once ran alongside two creeks leading to the port and New Haven’s harbor. The Green was used as a marketplace, burial ground, site for various civic and religious buildings including churches, schools, and State Houses, among many other functions. Outside the Nine Squares, pathways accessed grazing fields, farmland, and small outlying hamlets. A large swath of land north of the Nine Squares between Prospect Hill and Goffe Street was set aside as the town commons during New Haven’s settlement. By 1650, the “Common” was bisected by a pathway leading up to Hamden, which later became known as Dixwell Avenue. Named for John Dixwell, a judge that signed the death warrant for King Charles I in 1649 and reputedly later settled in New Haven having fled England when Charles II came to power, the thoroughfare also provides the name for the flanking neighborhood today. When New England entered its Second Maritime Era in the lead up to the Revolution, New Haven’s port bustled with activity – giving rise to a strong mercantile, artisan craft, and trading economy. Energized by the expansion and addition of wharves along the water, development pushed eastward of the Nine Squares and northward from the shoreline along Water and Olive Streets. By the time New Haven incorporated as a city in 1784, the growing Yankee town had amassed enough wealth to embark on a series of civic improvements throughout the Federal Era. Principal among these efforts was the relocation of the burial ground from the Green to a new cemetery outside of the Nine Squares. Occupying over 11 acres, the Grove Street Cemetery was laid out, planted, and designed as a formal garden for the deceased in 1796. The cemetery proceeds along the western side of Prospect Street from Grove until Trumbull Street where the topography slopes down causing the perimeter wall to veer off to the northwest following the East Creek to Lock Street. The topographical change marks the route that the Farmington Canal would eventually take from the harbor and East Creek past the Grove Street Cemetery to towns north. Beginning construction in 1825, the canal initiated a speculative building boom in New Haven that resulted in a series of satellite villages beginning to develop around the edges of the Nine Squares, including a quarter of shops, houses, and manufactories at the nexus of the canal and Orange Street. Beyond the cemetery, the old town common was used as grazing fields well into the 19th century, though a portion was sold off as a farm in 1850. By that time, the canal bed had been filled and converted to the New Haven and Northampton Railroad. Reliable, efficient, and expanding rail service from New Haven to places like New York, Hartford, and New London spurred development and helped crystallize the satellite villages surrounding the Nine Squares into distinct communities within the city. Along the former canal line, small manufacturing operations were established fueling the development of laborer housing in the wedge between Dixwell Avenue and Goffe Street. Meanwhile side streets running between Dixwell and Ashmun like Bristol Street developed ornamented frame houses owned by middle class residents working as managers, clerks, and shopkeepers – similar to what is found on the streets north of the Grove Street between Orange and State Streets. Also during the lead up to the Civil War, Sachem and Mansfield Streets caught some of the overspill construction from the Hillhouse Quarter with large private residences adding a flair of opulence to a rural area just east of the Northampton Railroad. Prior to the Civil War, New Haven’s economy in general and carriage manufacturing industry in particular was, in large part, dependent on the Southern market. After the War, the city went through a restructuring period – eventually emerging as an industrial powerhouse by the 1880s. 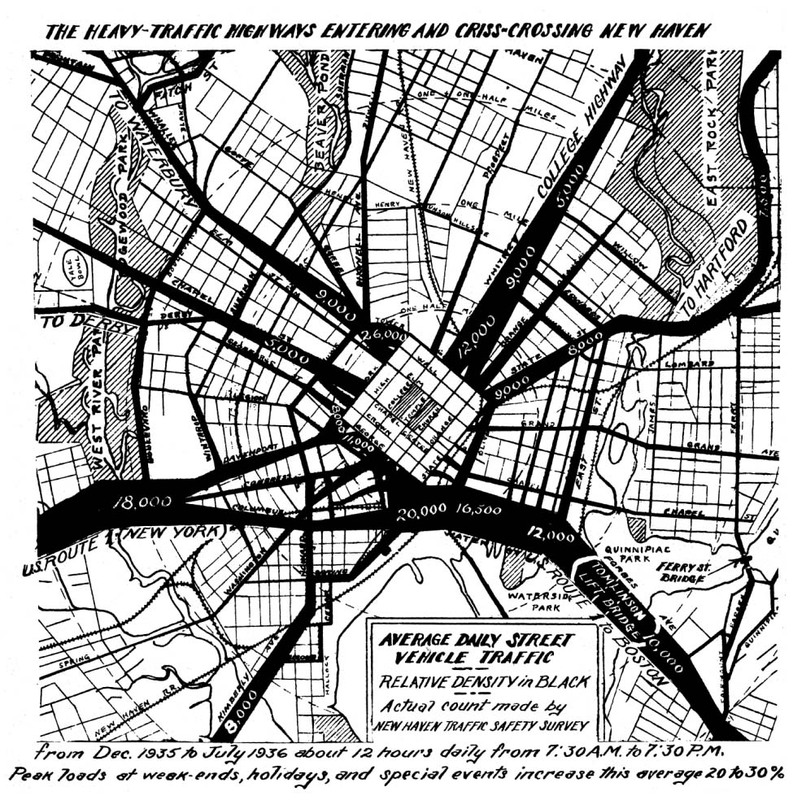 New Haven’s railroads consolidated under the New York, New Haven, and Hartford Railroad Company and the city welcomed a new scale of sprawling manufacturing plants producing a wide variety of consumer, military, and specialty goods. Before the rise of automotive travel in the early 20th century, horse-drawn carriages were the preferred method of travel for the well-off. And In the 19th century, the world’s carriage manufacturing industry was centered in New Haven. While New Haven’s carriages, manufactured from Wooster Square to Dixwell, served a world-wide market, the popular vehicle’s largest market existed in the Southern States, serving wealthy plantation owners and slave traders. After the Civil War, New Haven’s carriage industry collapsed – eventually finding a new home in Detroit where it transformed into the automobile industry. Meanwhile, innovations in manufacturing and technology allowed the Winchester repeating rifle, made in New Haven along the Northampton Railroad, to corner the sporting market in the 19th century by vastly reducing the time required to reload and fire. The rifle, known as “the gun that won the West” facilitated the rapid extermination of the indigenous population in what is now the Western United States. Not that the gun was responsible for the Manifest Destiny policy and its subsequent crimes – they likely would have still occurred though perhaps less swiftly – but the rifle did enable a more efficient genocide of Native Americans, not to mention the near extinction of bison as well. This shameful and despicable legacy, however, would have been largely absent in the day to day lives of New Haven’s Dixwell neighborhood residents at the time. For the city, these factories provided reliable employment paying a decent wage, steady flows of cash from taxes into city coffers, and symbiotic support for surrounding auxiliary businesses. New Haven’s industries, varying from architectural hardware and clocks to carriages and rifles, supported tens of thousands of families over multiple generations in the New Haven area with a livelihood with which to frequent local shops, purchase housing, and raise children. During the World Wars, especially, when federal contracts for military supplies vastly increased hiring at plants like the Winchester Repeating Arms Factory, steady wages funneled through the factory and spread out to the immediately surrounding neighborhoods – getting spent in real estate investments, local grocery stores, small services businesses, and civic organizations. The vibrant social life of neighborhoods like Dixwell in the early 20th century, characterized by streets teeming with factory workers, school children, delivery boys going to and from industrial plants, schools, and storefronts, were often times far removed from the destination of many of its exportable goods. While factories were producing goods for a global market, hiring and management was a decidedly local affair. The overwhelming majority of employees for the Winchester Repeating Arms Company in 1913, for instance, came from the blocks lined by modest, working class homes and tenements immediately surrounding the factory complex located at Munson and Winchester Avenue. Founded in 1866, Oliver Winchester moved the company to New Haven in 1870, placed factory buildings along the Northampton Railroad, and commissioned a mansion for himself on the hilltop of nearby Prospect Street among fellow industrialists’ estates where his factories could be observed. Midway on the hill between the mansions of Prospect Street and the tenements on Winchester Avenue, Mansfield Street sprouted large 2-family houses on narrow lots home to upper management and other middle class residents. The arrival of fixed-path transit in the form of streetcars in the late 19th century opened up land farther from the city center for development. As speculative building populated blocks of the Newhallville and Dixwell neighborhoods with rental apartments, small houses, and auxiliary businesses, investments in transportation infrastructure allowed residents to travel to and from work, the Green, and commercial areas. At the same time, portions of land that had been part of the old town commons around the Beaver Ponds were put to new uses. In 1890, a large city park with recreational fields, playgrounds, and natural features was created between Crescent Street, Sherman Avenue, Hamden, and Goffe Street. The 1850s-era farm was subdivided by the owner’s heirs into house-lots and developed over several decades in the early 20th century as the Beaver Hills neighborhood. An area was sold off to the State for a teacher’s college, which is now the campus of Southern Connecticut State University. In the mid-20th century, parcels were used for the construction of a police academy, Hillhouse High School, and an animal shelter. Around the turn of the 20th century, the city sought to acquire and create parkland like the Beaver Ponds Park and make general improvements to public infrastructure partially in an attempt to provide relief from the unplanned and loosely regulated private development in New Haven’s working class and industrial neighborhoods. Further efforts to address unsanitary, low value, and dilapidated housing for the poor in cities throughout the United States came from the New Deal-era’s National Housing Act of 1934, which created the Federal Housing Administration and the Home Owners’ Loan Corporation (HOLC). 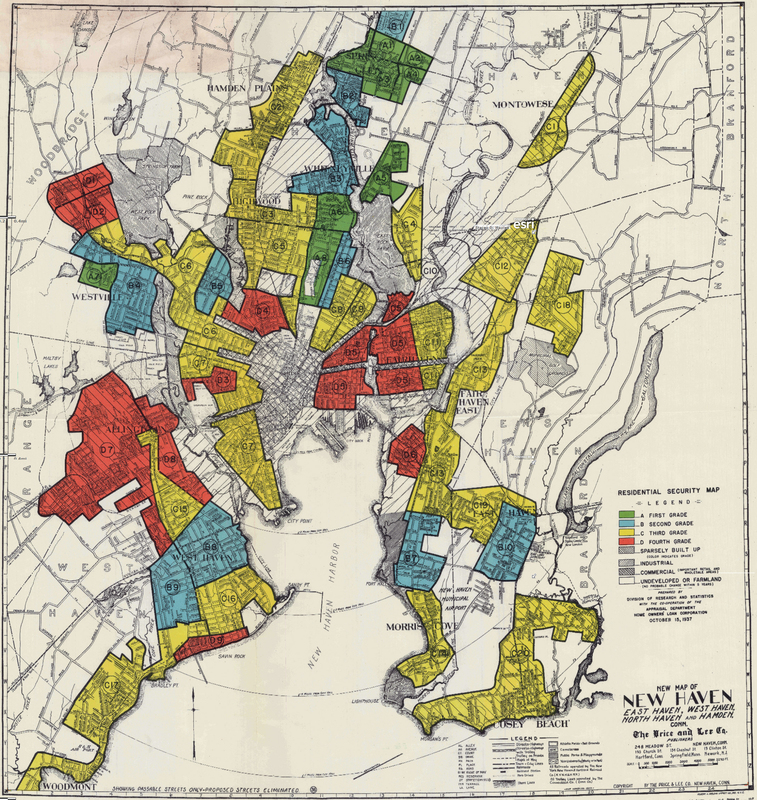 By 1937, HOLC had surveyed and rated the quality of New Haven’s residential areas based on a variety of factors including the ethnic composition of the community; proximity to non-residential land uses; and the condition, location, age, and type of housing, including single or multi-family, and owner-occupied or rental. The surveyors were unambiguously prejudice against ethnic minorities, mixed-use neighborhoods, working class culture, older construction, and multi-family rental dwellings. In effect, the Federal government discouraged banks from providing home mortgages to residents in working class neighborhoods. Predictably, urban property was less likely to receive an inexpensive federally-secured mortgage for new construction or remodeling, thereby contributing towards blight, distress, and decay in city neighborhoods. The same year HOLC conducted its survey of New Haven, congress passed additional provisions in the National Housing Act that provided federal funding for the creation of Housing Authorities, in addition to slum clearance and public housing development programs. The Housing Authority of New Haven’s first project was initiated in the Dixwell neighborhood, which had been redlined in the 1937 survey (D4 in the map above). Several blocks located between Dixwell, Eaton, Ashmun, and Foote Streets that contained houses converted into cramped apartments, rear tenements, and informal junk yards were targeted for clearance. Built in 1939, the 442-unit Elm Haven public housing project consisted of 36 two- and three-story apartment buildings for families. Originally conceived as veteran and worker housing, Elm Haven provided comfortable and affordable starter homes in the center of the city. Between the World Wars, the Winchester Repeating Arms Company changed dramatically. Having ramped up production and expanded its facilities during the First World War, by 1919 the company was looking for investors to help diversify manufacturing operations to include consumer products. Investors from New York eventually provided the funding, which began a transition from a locally-rooted industrial firm to a multi-national corporation. Never quite reaching the sales goals of investors, despite acquiring dozens of smaller companies, diversifying production, and opening retail stores, the Winchester Company ran a deficit. By the onset of the Great Depression, the New Haven factory complex was under the control of the Illinois-based Olin Corporation. While World War Two, and to a lesser extend the Korean War, provided the factory with a steady stream of government contracts for military equipment, similar issues reemerged for the company, and many others in the city, in the postwar years. The adjacent working class neighborhoods certainly experienced the brunt of this impact. New Haven in the mid-20th century was experiencing the onset of industrial decline characterized by manufacturing plants shrinking, relocating to cheaper suburban locations, moving to the American South or abroad in search of lower labor costs, or closing their operations. Compounding the issues of de-industrialization were the precipitous loss of middle and upper-income households to neighboring suburban towns throughout the 20th century; the prevalence of obsolete, decrepit public and private infrastructure; the increasing number of distressed buildings becoming inhospitable for living, manufacturing, conducting business, or administering governmental services; and frustrating traffic congestion and lack of Downtown parking contributing to declining retail sales. Under the Urban Redevelopment and Renewal programs initiated by the National Housing Acts of 1949 and 1954, the federal government funded major efforts to address this series of urban problems by rebuilding cities across the country for modern living, business, manufacturing, and shopping. 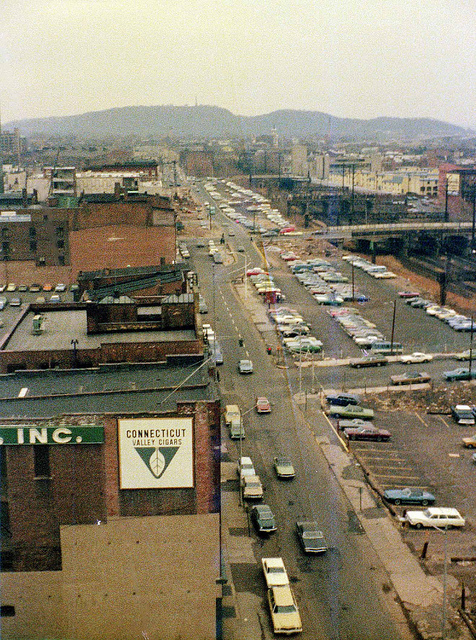 While obsolete industrial facilities were being rebuilt in Wooster Square, highways were carving through the center of the city, and parking garages populated important sites near the Green, efforts in Dixwell during this era focused on rebuilding residential, commercial, and civic structures in the neighborhood. Among the first projects in the neighborhood during the post-War era was the replacement of the former Winchester School and several buildings on Gregory Street with a new public school building located at 55 Foote Street in the early 1950s. A few years later in 1955, the redevelopment of several blocks of distressed housing and shops added 368 units of public housing in six high-rise residential towers ranging in height from 8- to 10-stories along Canal and Ashmun Streets next to the existing Elm Haven projects. 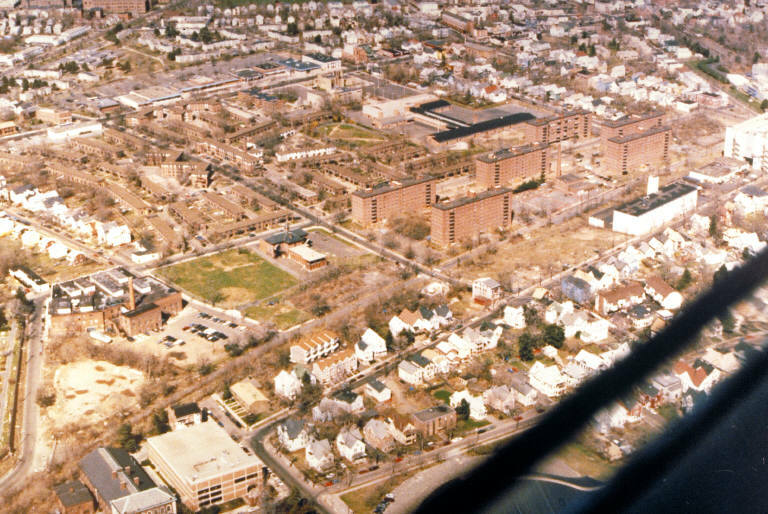 By 1960, New Haven’s Redevelopment Agency had begun a larger redevelopment and renewal plan for Dixwell, which included further demolition of the oldest and densest part of the neighborhood between Goffe Street and Dixwell Avenue. 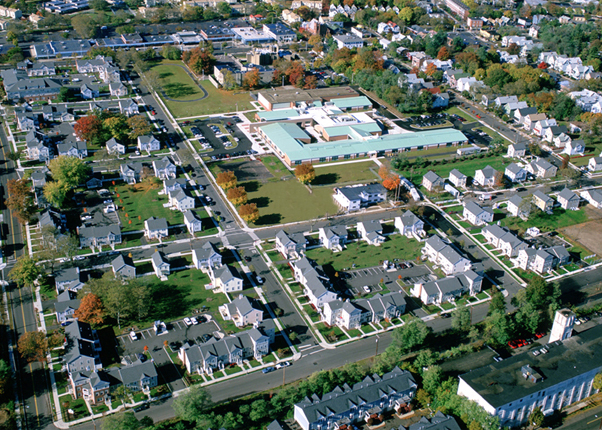 Replacing the old, narrow streets, small urban parks, and dense mixed-use neighborhood fabric were undefined wide open green spaces, plazas, and parking lots, the suburban-style single-story single-use Dixwell Shopping Plaza (1968), an experimental Helene Grant School building (1964), a new firehouse for the Dixwell Fire Station (1973), several private housing developments including Florence Virtue Homes (1964), St. Martin Townhouses (1968), and Goffe Street Town Houses (1970), and a new civic complex including a library branch (1968), community center (1967), and church (1968). 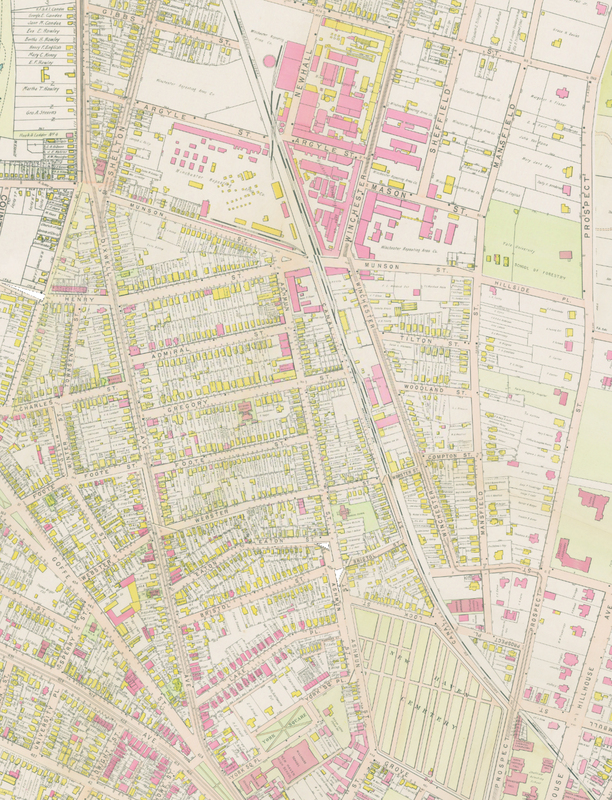 Dixwell was one of the most comprehensively demolished and rebuilt areas of New Haven during the mid-20th century with very little of the pre-war neighborhood left intact. Though the Dixwell Redevelopment and Renewal Plan was largely completed as planned, another proposed project of the 1960s would have greatly impacted the neighborhood had it been built. Yale University was intimately involved in the city’s urban renewal efforts – various affiliates of the school including faculty, relatives, and staff consulted for New Haven’s Redevelopment Agency and other governmental departments. The University also played an integral role in advocating for and steering redevelopment initiatives towards the benefit of Yale. Encouraged by the federal and state funding pouring into New Haven at mid-century, public school construction projects allowed the University, for instance, to achieve large-scale, comprehensive expansion of its undergraduate residential colleges along Tower Parkway. By purchasing the former site of three New Haven high schools in a deal with the city, Morse and Stiles Colleges could be built with a fraction of the effort required of earlier incremental methods. The University’s involvement also reveals itself in the areas around the medical school, Science Hill, and York Street as indicated by Yale’s support for a beltway road system around the Downtown and central campus. In addition to the route of the proposed new highway loop shown in the map above, later revisions included extending the road system along a widened Howard Avenue, Columbus Avenue, and State Street. While most of the proposal was eventually mothballed, the east side of State Street was demolished in 1975 and the roadway divided and widened. Despite the monumental effort put into rebuilding the Dixwell neighborhood and thwarting the construction of a bisecting highway, these mid-century initiatives seemed to have little positive impact on the overall trend of the decay and divestment from the neighborhood. New greenfield development in suburban locations remained the preferred avenue for new investment. 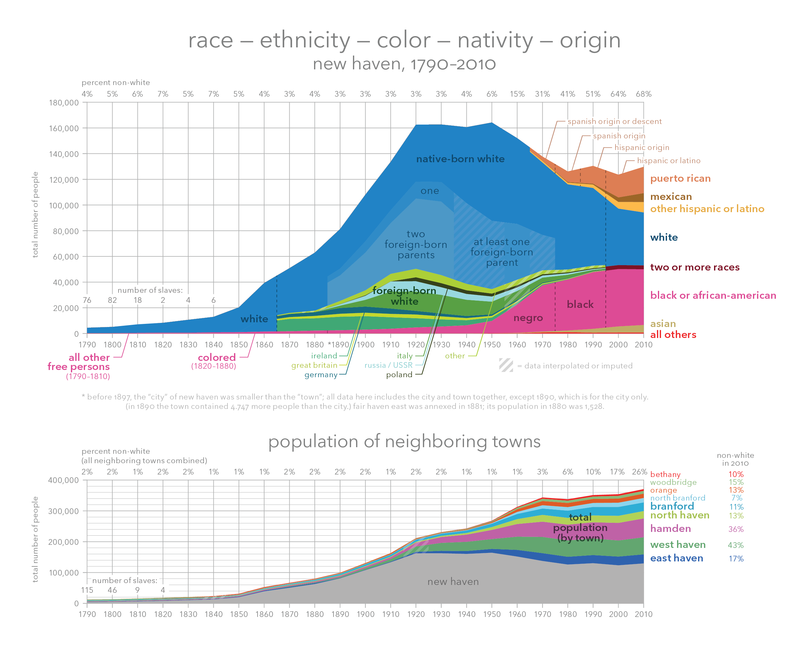 Accordingly, New Haven’s population continued to plummet through the rest of the century – actually accelerating due to eminent domain seizures and relocations in the 1960s. Meanwhile, violent and property crime rates began an unrelenting accent. Fueled by industrial wage loss and mismanagement by HANH, public housing ceased to be a temporary home for upwardly mobile families and became concentrated, permanent warehousing for marginally-employed, single-head households in the post-war era. By the 1980s, Dixwell’s Elm Haven projects, the home turf of the Tribe, had become one of the city’s chief sites for the sale of cocaine by violent, neighborhood-based drug gangs. Abandoned factory buildings, vacant lots, and burned out houses provided the backdrop for rampant property crime, theft, and street robberies to fund drug addictions, and shoot-outs between rival gangs sparked by turf disputes, acts of disrespect, and money debts. In the decade between 1980 and 1990, New Haven’s violent crime rate doubled to 3,058.8 incidents per 100,000 population, which represents a 7,113.5% increase as compared to 1940. 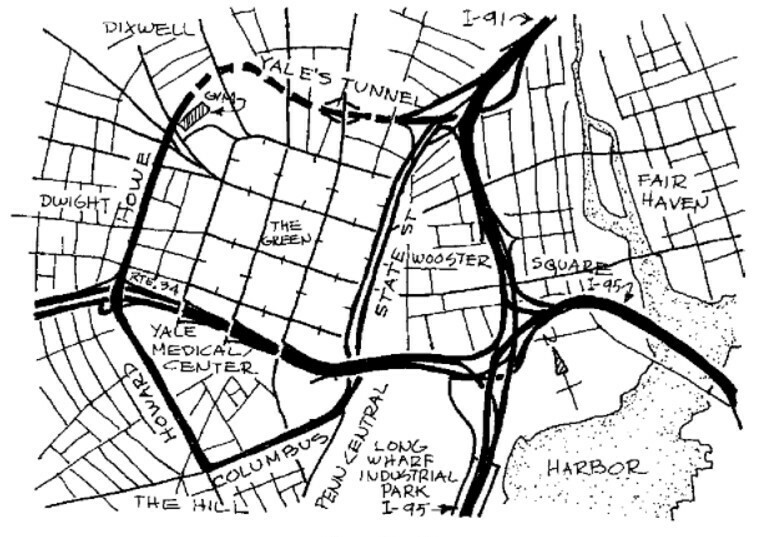 Having failed to get a complete highway loop around the Downtown and its central campus and with the Urban Renewal program having come to an end in 1968, Yale University sought other strategies for expanding while also insulating itself from increasingly volatile conditions in immediately surrounding neighborhoods. Throughout the late 20th century, Yale continued to do what it always had done to expand beyond its Old Campus – purchase nearby property, convert buildings to academic uses, and in many cases bundle multiple properties for comprehensive redevelopment. Despite the absence of federally-subsidized land acquisition and demolition costs for New Haven, Yale was still able to dramatically increase its landholdings in the decades following Urban Renewal. Thanks to the devaluation of urban land during the de-industrial era, abandoned, vacant, and underused properties could be purchased relatively cheaply. 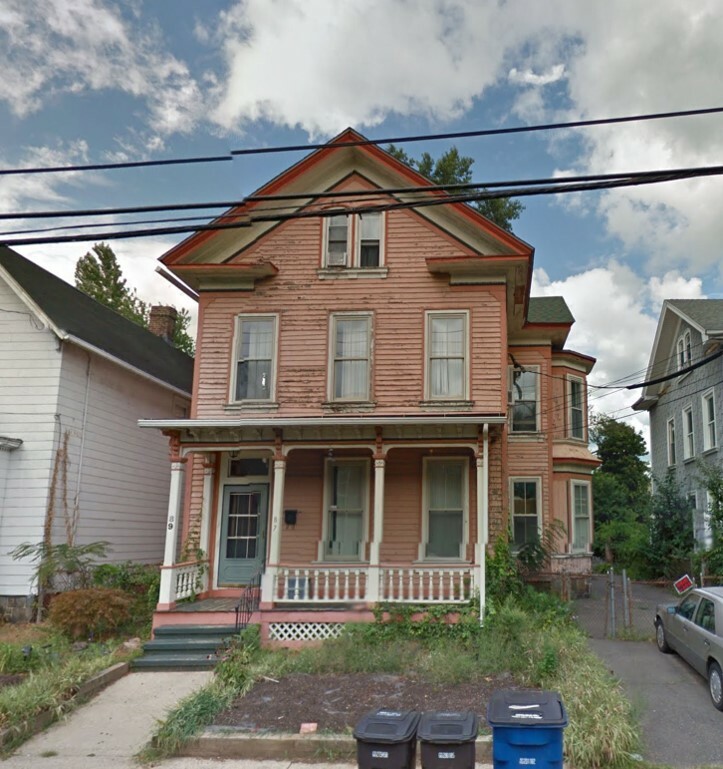 While it may not have made financial sense in the 1980s for a private, for-profit developer to purchase low-cost properties of a bygone era given New Haven’s distressed economic environment, Yale University – with its large endowment and not purely profit-driven motivation – was able to do so without much strain. The relative ease with which Yale was able to expand its campus in the final decades of the 20th century stands in contrast to the effort required for growth in the late 19th and early 20th centuries. For Yale, whose plans for growth are largely publicized and predictable, land acquisition is quite an expensive, difficult, and time-consuming process, which was especially true during New Haven’s industrial heyday when centrally-located land was increasing in value. In the early 20th century, “the University [was able to] overcome its handicaps of publicity and predictability, in part by employing many of the strategies of successful commercial developers, including secrecy, subterfuge, and stonewalling,” as Marinn F. Carlson explains in A Tale of Two Blocks: Institutional Land Assembly in New Haven, 1911-1928 (New Haven Colony Historical Society, 1998). Far from acting alone, however, Yale also benefited substantially from New Haven’s seizure, through eminent domain, of private property along Grove Street for the creation of Tower Parkway in 1927 – a move that not only enabled Sterling Library and the Law School to be completed, but also provided a site decades later for the construction of Morse and Stiles Colleges further up the street. By the mid-1970s, the University owned substantial portions of the former enclave of New Haven’s industrial wealth around Prospect Hill. Although located several blocks to the north of Yale’s Old Campus, Prospect Hill aligned with the 19th century path of trajectory for the Sheffield Scientific School’s growth along Hillhouse Avenue and Prospect Street. In the first half of the 20th century, Yale University looked to connect the academic and scientific campuses with a series of planning and building projects, including the Bicentennials buildings, Cross Campus, and residential colleges. Once connected to the central campus, Prospect Hill became an avenue for academic and scientific University expansion northward. A Modern building wave at mid-century brought the Gibbs Laboratory (1955), Ingalls Rink (1958), and Kline Biology Tower (1966) among many other buildings to the area christened “Science Hill”. As new development subsided after the mid-century boom, another kind of expansion crept up Prospect Street. Lavishly designed mansions along Prospect Street happen to fit with Yale’s aesthetic appeal, while the spacious, multi-room building layouts accommodate staff offices and other academic functions with minimal design intervention. The University also played a supporting role in the creation of the Science Park Development Corporation – formed in 1982 as a joint venture between Yale, the City of New Haven, and the State of Connecticut to turn the former Winchester Repeating Arms factory complex into a modern incubator for small technology companies. With expectations of hiring scores of local residents through the revival of a once thriving economic center for the city, the project received $50 million in public financing. The University ended up being involved at an arm’s length initially and nowhere near what had originally been envisioned in terms of a local economic renaissance has been achieved – though private development in the area and the presence of Yale have increased in recent years. Having replaced many of the multi-story brick and concrete factory buildings abutting streets with single-story facilities setback from the sidewalk by surface parking lots and tall fencing, however, the project did successfully establish an institutional outpost along the northern border of the Dixwell neighborhood. With the appointment of Rick Levin as president of Yale in 1993 and election of John Destefano Jr. into the mayor’s office that same year, the University added “commercial real estate developer” to the list of major roles, along with employer and landholder, it would come to play in the city since the onset of urban industrial decline. In April of 1994, the University launched the Yale Homebuyers Program, which provides $30,000 over 10 years to Yale employees purchasing homes in designated neighborhoods within New Haven with an additional $5,000 incentive for purchasing homes in Dixwell before December 31, 2017. As of the Fall of 2015, the program has supported more than 1,134 homebuyers throughout the city (every New Haven neighborhood was eligible for the program during the first two years) . On the City’s side, scores of abandoned city-owned buildings were demolished throughout Dixwell and lower Newhallville in 1996 by the Livable City Initiative (LCI) in order to remove hazardous, blighted, and vacant properties from distressed city neighborhoods. On the affordable housing development front, between 1997 and 2000 the city acquired properties along the north side of Division Street across from Science Park, the site of a former apartment complex built in the late-1980s. In an attempt to attract moderate-income families to Newhallville, from 1998 to 2002 the city built the Thomas E. Holmes Estates, a decidedly suburban-style development of 16 neo-traditional single-family houses with 3-bedrooms, well-manicured fenced-in lawns, and prominent garages sold individually to families whose incomes are 80% of the City median. 15 years earlier, a similarly suburban-style development was erected along the south side of Bristol Street. Consisting of 6 single-family colonial-revival style saltboxes, the houses between 56 and 76 Bristol Street replaced a half block of narrow multi-family wood frame dwellings, which had fallen into a state of disrepair by the 1970s but were comparable to small houses found on neighboring streets. Though built without garages, the new development is no less peculiar-looking compared to its surroundings than the Division Street Estates, which appear as transplants from Hamden’s Whitneyville neighborhood dropped into the center of New Haven. With the creation of Yale University Properties in 1996, the University began to manage commercial office, retail, and a residential portfolio that today includes 500 apartments, and 85 retail tenants. Early efforts involved acquiring properties along Chapel, Broadway, Audubon, and Park Streets followed by streetscape improvements and careful selection of tenants to not only serve regional shoppers and students, but also create the atmosphere of an outdoor mall in an urban setting. The cultivation of a desired atmosphere is evidenced by Yale’s demanding lease agreements and practice of leaving retail storefronts vacant until a satisfactory tenant that contributes towards their vision for the overall district is found. In this way, Yale Properties does not appear to be driven purely by profit from rent. Recent commercial acquisitions have spread along lower Dixwell Avenue where the University temporarily housed an office for the Yale Police in a storefront (now the UPS Store), and is building apartments, shops, and a surface parking lot. Yale remained involved in advocating for various planning efforts by governmental agencies, including the City Plan Department and HANH. In 1993, Yale supported the creation of another biotech office park along the Route 34 West Corridor aimed at supporting the Medical School with laboratory space and pharmaceutical companies. The Biotech Park, which would have included large parking facilities, new lab buildings, and a six-lane roadway, also would have aided in further separating the Hill neighborhood from Dwight where in 1996 the University began promoting its homebuyer program in a similar fashion to today’s Dixwell neighborhood. With little investor interest, however, the Route 34 West Biotech Park never materialized. Also in 1993, HANH was awarded a competitive HOPE VI federal grant to redevelop the Elm Haven public housing project – a process that began in 1989 when HUD approved HANH’s request to demolish the 366-unit Elm Haven extension high-rises – into a mixed-income, privately managed residential community for families and seniors. The new development, named Monterey Place, consists of 200 townhouse- and duplex-style units for families built between 1999 and 2002, 139 units for seniors in a new apartment building on Webster Street and a renovated urban-renewal era Edith M. Johnson Tower on Bristol Street, 53 single-family owner-occupied houses along a newly created cul de sac on Ashmun Street and Francis Hunter Drive built in 2005. The authoritarian management of Monterey Place by Boston-based Corcoran Jennison Management LLC is similar to that of HANH’s properties in the 1940s and 50s when applicants were carefully screened, units could be searched, and tenants might be fined for things like littering. While privately owned, Monterey Place is subsidized through a renewable HUD rental payment agreement and a local New Haven tax abatement. New Haven’s crime rate steadily decreased throughout the 1990s and early 2000s, and Downtown’s residential population, nightlife, and food services industry have grown. However, not until the redevelopment of Elm Haven – an icon of urban distress – did Yale University’s own development efforts cross to the west side of the former Northampton Railroad bed north of the Grove Street Cemetery. In 2001, Yale University acquired the block bounded by Canal, Bristol, Ashmun, and Lock Streets. While that block was being redeveloped, New Haven Reads, a non-profit organization aimed towards increasing literacy skills of children through tutoring, family support, and access to a free book bank, opened in a Yale-owned existing building at 45 Bristol Street at the corner of Ashmun in 2003. 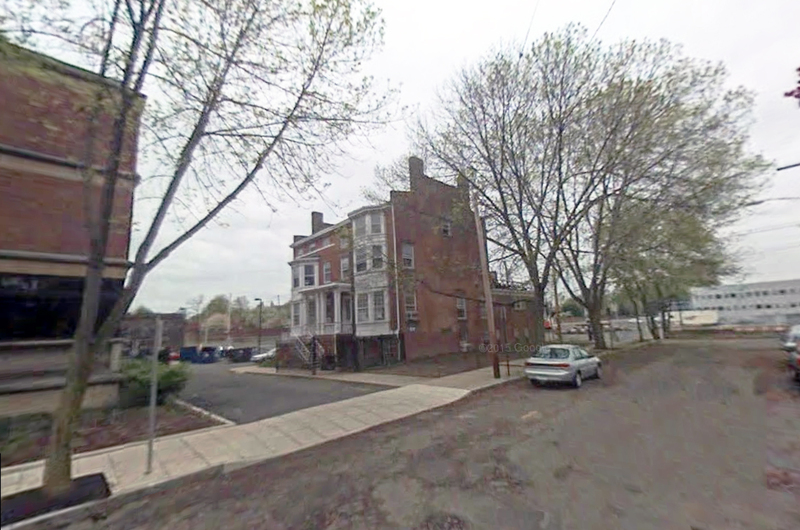 Ashmun Street, with the construction of frame buildings beginning in the 1850s as part of a wave of construction during New Haven’s antebellum manufacturing era, was one of the first to develop in the neighborhood. Residential construction along the north side of Lock Street across from the cemetery followed in the 1860s. By the next decade, the entire block was populated by a few small shops, and several dozen modest wood frame dwellings in duplexes, free standing houses, and tenement buildings on 30 or so deep, narrow lots. In the 1910s, a handful of houses were demolished at the corner of Lock and Ashmun Streets and the properties combined in order to welcome the new home for the Majestic Laundry Company. Incorporated in 1905 by Edward J. Duggan, a native of New Haven and son of Irish immigrants, the Majestic Laundry Company moved from East Street to a 100 square foot, two-story facility on Ashmun Street in 1917 to accommodate its 75 employees. Over the following decades the industrial plant steadily expanded along Lock and Ashmun Streets – eventually occupying the entire Ashmun Street frontage from Lock to Bristol Street by the 1950s. By the time land sale records show the American Linen Supply Company, a multi-national business founded in 1889 in Nebraska, purchase the property in 1966, only six residential buildings remained along Canal and Lock Streets. Four years later the block contained no other structures besides the Linen Supply Company building, the footprint of which occupied only a third of the block. Shortly after becoming AmeriPride Services, Inc. in 1998, the property of one of the Dixwell neighborhood’s long-time local employers was slated to be sold to AAIS Corporation, an asbestos removal company, in February of 1999 before Yale University stepped in to purchase the site. 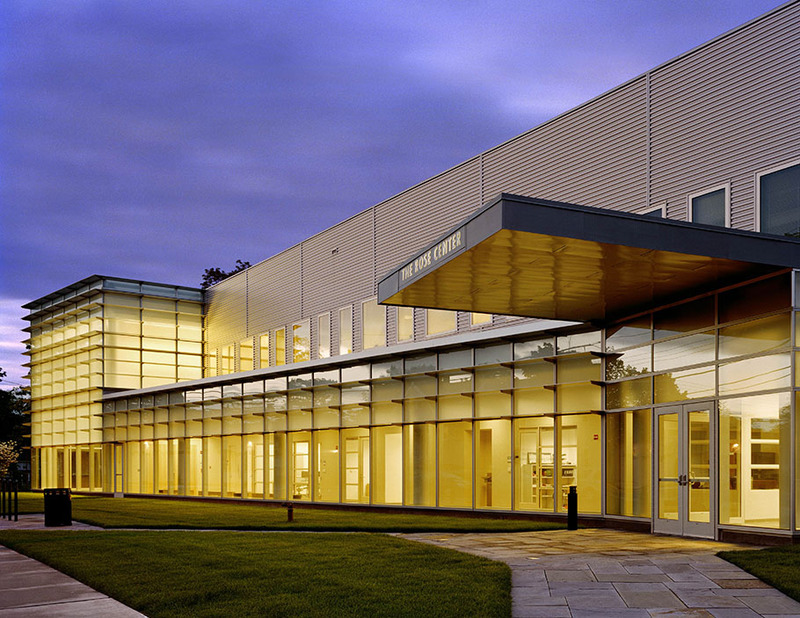 The first of Yale’s building projects on the block, the Rose Center, a community learning center and new home of the Yale Police Department, opened in 2006. The same year the Rose Center opened, Yale University announced that it would partially fund a portion of the Farmington Canal Heritage Trail through its properties. Service along the Northampton Railroad, having declined throughout the 20 century, came into complete disuse in New Haven during the 1980s. Beginning in 1996, however, portions of the railroad were converted to a multi-use recreational path between New Haven and Plainville, CT. The portion of the trail between Hamden and Downtown New Haven – through a combination of Yale University and City-owned properties – opened by 2009. The following year, a new 145,000 square foot 4-story Yale Health Center was completed opposite the Rose Center near the corner of Lock Street and the canal trail with a 3-story 250-space parking garage between them. Simultaneously, the block to the north bounded by Bristol, Ashmun, Webster, and the Canal Trail was being turned into a new City park. This block has a similar development history as its southern neighbor in that during the late-19th century it developed 30 or so modest wood frame dwellings on nearly as many lots, in addition to several ground level shops. In the first decade of the 20th century, however, this block welcomed the 2-story brick St. Mary’s Parochial School on an L-shaped lot mid-block along Ashmun Street. While the Elm Haven low-rises were built in 1939 and the high-rise in 1955 to its north and west, this block remained largely intact until the mid-20th century when an addition was built onto the rear of the school and houses began to be replaced with parking areas or left as vacant land. Close to a dozen buildings had been demolished by 1965 and within five years no other buildings remained on the block besides the private schoolhouse. Used by the St. Martin De Porres Academy beginning from 1956 until the school’s move to Columbus Avenue, the Ashmun Street schoolhouse sat abandoned in the late 1990s and was eventually demolished during the development of Monterey Place. The block was vacant – except for a basketball court near the corner of Bristol Street and the railroad – for nearly a decade before being turned into Scantlebury Park. Equipped with a playground, splash pad, ball field, expanded basketball court, and an expansive open green area, the park hosts a number of community events and is well-used by nearby residents during nice weather. Running parallel with these developments, the population of Dixwell, or census tract 1416, grew by 3.2% between 2000 and 2010. While the completion of Monterey Place accounts for some of that growth, the black population declined while the white, Hispanic, and Asian populations grew, which is indicative of property investors and Yale employees purchasing houses in the residential blocks bounded by Mansfield Street and Winchester Avenue between Sachem Street and Hillside Place – an area referred to as the Winfield section. In 2015, a private developer renovated a series of distressed properties christening them Ashmun Flats at 320 Ashmun Street, which included a former Church and problem bar for the neighborhood, into market rate rental apartments and retail space. 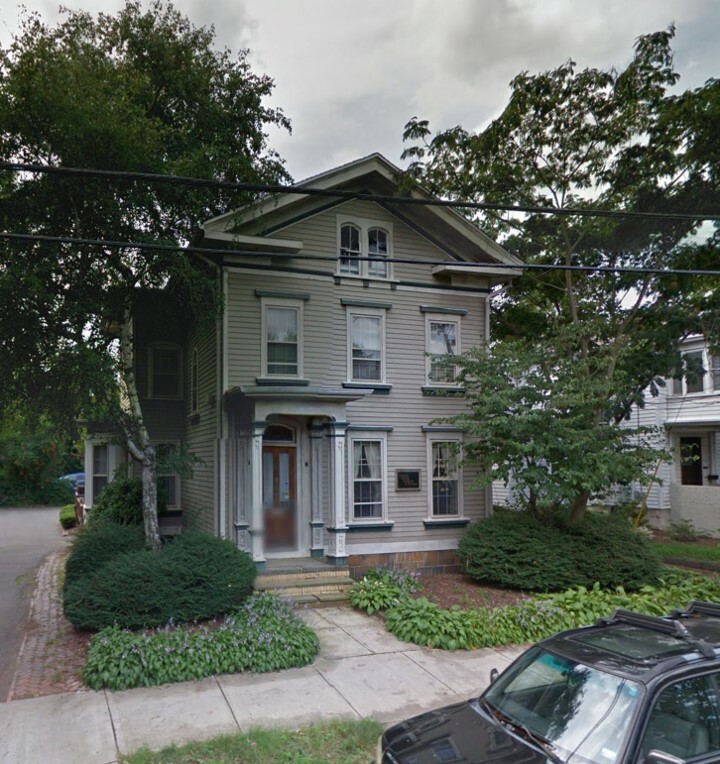 In addition to acquiring properties along Sachem and Prospect Street, from 1969 to 2002 Yale University purchased nearly all of the houses along the eastern side of Mansfield Street. On the western side of the Grove Street Cemetery, Baker Hall, a swing-space dormitory with a closed courtyard at the corner of York Square Place and built in 1998, joined the University’s power plant on Tower Parkway – replacing a surface parking lot with an open green in front of Payne Whitney Gymnasium. The following year, Yale’s 57,000 square foot Lanman Center addition to the gymnasium opened, while Monterey Place was beginning construction. Built behind the iconic gymnasium, the addition faces Lake Place, a once stately block lined by brick duplexes, walk-up apartment flats, and free-standing houses dating mostly to the last decade of the 19th century. At the turn of the 20th century, Dixwell’s Lake Place was comparable to the Dwight neighborhood’s Lynwood Place. Beginning at mid-century, however, small surface lots began replacing residences along the south side of the one block street running between Ashmun and Dixwell. By the end of the century, a Yale surface parking lot stretched nearly the entire block except for the four residential properties located at 20-38 Lake Place near the corner of Ashmun next to an Auto Repair Shop, which was purchased by the University in June 2016. As for the residences, which consisted of one modest wood frame building dating to the opening of the street in the late 19th century and three brick apartment buildings built in the early 20th century, 20-38 Lake Place were eventually demolished in the mid-1990s to make way for the Lanman Center. Long since existing as a fraternity row, the University officially acquired half of the houses along the north side of Lake Place in 2013 across from the Lanman Center, in addition to several adjacent properties along Dixwell and Ashmun Streets. Between 2005 and 2010, Yale purchased three properties at the southern tip of the block wedged between Dixwell Avenue and Goffe Street. The lots are being turned into a surface parking lot to replace the existing lot at 272 Elm Street that serves the Broadway retail district and where a new mixed-use graduate student apartment building with ground level retail is being built. With the acquisition of these parcels, lower Dixwell and the Grove Street Cemetery, once located on the edge of New Haven, are now firmly within Yale’s Main Campus. In addition to acquiring every property facing the cemetery over the last century, the University began moving northward up Prospect Hill in the 70s, Mansfield in the 80s, Ashmun Street in the 90s, and finally Canal Street in the first decade of the new millennium – resulting in the area north of the cemetery sitting comfortably within the Yale domain. Since 1982, public, private, and institutional building projects in the area have established a continuous institutional corridor between the Yale Campus and Science Park along Mansfield Street and the Farmington Canal Greenway. Included among these recent projects is the renovation of several former factory buildings for the headquarters of Higher One, a financial services company now owned by Blackboard, in 2010 and Winchester Lofts, a 158-unit luxury apartment building, in 2015. At the tip of this newly-redefined corridor where Canal Street and Winchester Avenue meet Munson Street at an angle, a 300,000 square foot trapezoidal office block rises as an extrusion of the building lot. Previously part of the Winchester Repeating Arms Company complex, the building at 25 Science Park contained a functioning indoor shooting range until 1986 when the building was acquired by the Science Park Development Corporation. Located across Canal Street at 169 Ashmun Street was Reuben H. Brown’s Nonantum Fish and Game Club in a series of brick buildings occupying the entire Henry Street frontage around the turn of the 20th century. By 1973, the masonry complex was part of the Olin Corporation’s massive property holdings of the former Winchester Repeating Arms Company. Demolished around 1980 along with several other vacant industrial buildings in the area, the site has remained undeveloped for over 30 years despite being planned for residences as part of Monterey Place and a daycare for Science Park. In September of 2016, however, the City of New Haven put out a Request for Proposals for a mixed-use development on the site. Similar to other parcels located adjacent to the Northampton Railroad, there had been various factories, tenements, barber shops, saloons, and modest dwellings established along this Ashmun-Mansfield corridor in the late-19th century. In the 1880s, the northern most site of the corridor was home to R. H. Brown Hardware Specialties, a manufacturing enterprise of 75 employees working in a series of brick factory buildings that included a machine shop, office, packing area, and woodworking room, among other spaces along Ashmun Street. By the turn of the 20th century, several wood frame dwellings and another brick factory building that the Winchester Arms Company used as storage had replaced the hardware factory. To the south, on the current site of a surface parking lot behind 25 Science Park, sat a grain elevator with a capacity of 36,000 bushels. By 1911, the Pfleghar Hardware Specialty Company joined the corridor south of the grain elevator at 182 Winchester Avenue. Four years later, in 1915, the Winchester Company built their World War 1-era factory building on Munson Street now owned by Winstanley Enterprises and home to around 800 Yale University employees. Across the street, Carter Winstanley’s Massachusetts-based development corporation also demolished a c. 1905 Winchester Company factory building in order to construct a 1,186 space parking garage with 15,000 square feet of ground level retail to serve the primarily suburban-dwelling Science Park office workers and new luxury apartment renters. Mid-way along the corridor at the intersection of Webster Street and Winchester Avenue once stood the G & O Manufacturing Plant until its demolition around 1980. Started in 1915 by Charles Oppe and Frederick Gargiulo, the corporation manufactured engine cooling radiators. The site is now home to a condominium complex built in 1992 that consists of four 2-story buildings above garages and arranged along a private alleyway accessed from Webster Street. Across the former railroad tracks and prior to the building’s demolition in the 1980s, the Continental Baking Company formerly sat in a 20,000 square foot facility amid the towering Elm Haven High-Rises as a remnant of the scores of industrial firms previously strung along the Northampton Railroad in Dixwell and Newhallville. At the base of the corridor sits a triangular block bounded by Prospect, Sachem, and Canal Streets. Until recently, this site was located on the western edge of the Hillhouse Quarter directly abutting the Dixwell neighborhood. Over the last decade as recreational, commercial, and academic land-uses have grown in the area, the block has become comfortably buffered from Dixwell. Once existing as separated linear extensions out from the Core Yale Campus along Hillhouse Avenue and Tower Parkway, the Science Hill and Broadway Campuses now connect to one another to form a nearly seamless institutional fabric across the top of the Grove Street Cemetery. In 2009, Yale proposed reinforcing this connection by redesigning and opening parts of the Grove Street Cemetery wall to create a pedestrian through-way in an ultimately unsuccessful attempt to further connect the two campus areas and perhaps avoid any isolation and remoteness perception issues. 1. Science Park Former firearms complex being redeveloped as a small-business incubator. 2. Monterey Place New small-scale housing to replace blighted Elm Haven public housing project. 3. Scantlebury Park Neighborhood park being renovated with financial help from Yale. 4. The Rose Center New home for the Yale Police and the Dixwell-Yale Community Learning Center. 5. Farmington Canal Greenway Linear park that will soon stretch north to Cheshire. With the development efforts of Yale University, the City of New Haven, the Housing Authority of New Haven, and numerous private investors in Dixwell in recent decades, the Yale Central Campus has expanded and a buffer has been created along the Hillhouse Quarter’s western edge, which until recently had directly abutted the Dixwell neighborhood. In creating this buffer, not only has Yale’s campus extended to the once remote Science Park, but it has also connected the Science Hill Campus across the top of Grove Street Cemetery to lower Dixwell Avenue. In cultivating the land along the southeastern border of the Dixwell neighborhood’s Bristol and Canal Streets, Yale prepared the triangular site at the foot of Winchester Avenue for the planting of the University’s quintessential building type. The two new residential colleges, the first to be built at Yale in over 55 years, are located at the hinge between the Broadway/Tower Parkway Campus and the Hillhouse Quarter where the new corridor from Science Park terminates. In coordination with preparatory work on the site of the new residential colleges, Yale purchased and demolished the former factory building located up the street at 182 Winchester Avenue in 2009 in order to construct a scale model mock-up of the new buildings as well as provide a job site for workers’ trailers during construction, thus reinforcing this institutional corridor to Science Park. When compared to the relatively compact campuses of its Ivy League peers, Yale University’s campus seems unusually long and narrow – spanning for two miles at just a half mile wide. Having expanded over the centuries by weaving into New Haven’s urban fabric – re-purposing its existing buildings, building along its streets, inhabiting former industrial zones – Yale is somewhat uniquely intertwined with its host city. As a result, creating a unified, well-connected core campus has consistently been a challenge for the University. In the 1850s, the Sheffield Scientific School was growing along Prospect Street north of Grove Street quite separately from the Brick Row along the top of New Haven’s Green. Not until the turn of the 20th century with the construction of Yale’s Bicentennial Buildings did the University begin to close the gap between the core academic campus centered around Old Campus and the scientific school spreading up Prospect Hill along the border of the Dixwell neighborhood. In 1904, the Sheffield Scientific School’s Hammond Hall was built on Mansfield Street near the corner of Sachem Street adjacent to the Northampton Railroad on the eastern edge of the Dixwell neighborhood. Nearly 30 years later and on the other side of the Grove Street Cemetery, Yale’s Payne Whitney Gymnasium opened along Dixwell’s southern border. Over the next three decades, the University filled the gap previously occupied by New Haven’s public high school buildings and a city park with the Law School complex along York Street, and the Morse and Stiles residential colleges. Prior to the mid-20th century, Yale’s ability to expand was limited mainly by the financial burden of assembling increasingly expensive land in the center of a growing industrial city for the construction of new buildings. For much of its history New Haven was, in large part, a civil place that enjoyed widespread economic stability, a thriving civic life, and low crime rates. As such, the University was able to expand more or less freely into the blocks surrounding its main campus with little concern for creating a seamless campus. While this remained true through the early 20th century, Yale did make use of landscaped moats, fenced gateways, and inner courtyards to separate its central campus buildings from the noise, traffic, and anonymity of New Haven’s bustling Downtown streets. With 2000’s A Framework for Campus Planning, connecting the Broadway and Tower Parkway area with Hillhouse and Science Hill through lower Dixwell and the Grove Street Cemetery became a major priority for the University. The planning document calls for the “creation of recreational and community facilities while establishing a connection across the Farmington Canal that links the north and south parts of Central Campus” on the former sites of the Majestic Laundry Company building and St. Mary’s Parochial School. What enabled the Prospect-Sachem Triangle site to be developed as two new residential colleges was the decades long effort put into redeveloping the Dixwell neighborhood through a series of government-funded projects and subsequent Yale University initiatives. Once the surrounding area was cultivated, the site could be prepared for the planting of more sensitive collegiate uses, like undergraduate student housing, rather than the accessory spaces that previously occupied the blocks in a hodgepodge of buildings. Due to Yale’s development efforts, the site was no longer at the edge of campus directly abutting Dixwell, but instead was buffered from the neighborhood and seamlessly connected to other areas of campus around the Grove Street cemetery. Despite Science Park’s shaky beginnings – characterized by its failure to achieve initial locally hiring goals, and lack of expansion in a Route 34 West biomedical park – the University’s persistence in developing Dixwell seems to have paid off for the institution. Yale University’s intervention into the neighborhood is perhaps more of a mixed blessing from the neighborhood’s perspective. 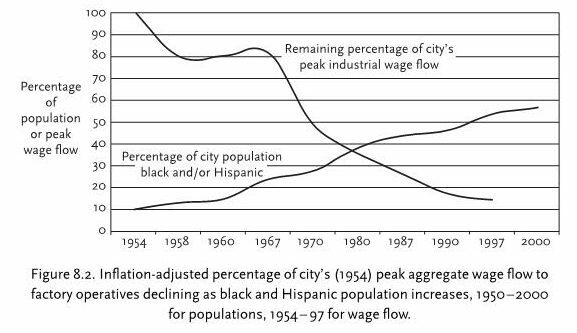 Industrial wages for New Haven residents and the number of manufacturing firms operating throughout the city, including in Dixwell, went into steep decline in the decades following the Second World War. By the 1980s, the corridor along the former Northampton Railroad was strewn with vacant industrial buildings. The few structures remaining in the area by the 2000s were either soon demolished by the University, replaced with offices and parking by private developers, or re-used as part of Science Park, Higher One, and Winchester Lofts. While the University has, in large part, claimed an area that had been abandoned and disused, a longer range view reveals a neighborhood still without an economic anchor. While the number of jobs, particularly those that pay above a living wage, have increased within New Haven’s core, residents of the city’s low-income neighborhoods, including Dixwell, have increasingly relied on low-paying service jobs in surrounding suburbs. Additionally, longer commutes and an unreliable transit system can exacerbate household transportation costs or make finding employment more difficult in neighborhoods like Dixwell where 50% of the population is low-income. Over the last 40 years, Dixwell has lost a major employment center, dealt with derelict, abandoned, and vacant industrial properties, and is now home to tax-exempt land-uses in an area that was once a source of neighborhood stability, growth, vitality, and cohesion. The neighborhood, through no fault of its own, lost its economic foundation and endured through decades of deindustrialization and property decay, the results of which provide institutions like Yale University with land acquisition, redevelopment, and expansion opportunities. While Yale cannot be expected to replicate the role that manufacturing firms once played in New Haven, having a certain level of awareness about the meaning that these industrial areas embodied for city neighborhoods should encourage institutions to seek ways of being a good neighbor. In some ways, the University has attempted to support Dixwell through New Haven Reads, community learning space in the Rose Center, the homebuyers program, and funding contributions to the Canal Trail and Scantlebury Park. This uneasy relationship between neighborhood and institution contributes towards a discussion about whether cities should be thought of primarily as physical places and the temporary holders for people, customs, and economies passing through, or if cities are defined by the needs and desires of their residents at a given time. Do current residents need to adapt to ever-changing cities? Do cities owe something to current residents that have been left behind by change? While there may be no legal obligation to hire locally, the negative impacts of not doing so such as inducing commuting, increasing traffic pollution, building oversized parking structures and roads, creating inactive and uninhabited nighttime and weekend zones, etc. can and should be discouraged through policy changes and hiring practices. Another approach to expanding economic opportunity within New Haven for residents might be to encourage small retailers and food service establishments catered towards current residents and new higher-income households moving into the city to open along neighborhood commercial streets like Winchester Avenue. Not only is the demand for this market very tight in Dixwell, but often times the need is met by chain stores and restaurants – making opening a successful locally-owned business difficult. By taking an active approach, however, the City’s Small Business Service Center, which provides guidance for residents looking to start businesses, may be able to foster a thriving local service industry by conducting community outreach, facilitating partnerships, and encouraging communal entrepreneurship among city residents. The expansion of a popular food truck in New Haven to a storefront at 302 Winchester Avenue in Science Park and the opening of a hair salon may offer examples for the kind of local small businesses that provides opportunities for neighborhood residents, especially as phase two of Winchester Lofts gets underway and the rest of Dixwell and New Haven continue to change and grow. Lastly, when viewed as types of expansion and growth patterns rather than as isolated building projects, Yale University’s development efforts in Dixwell may offer insight into what residents of the Dwight, Hill, and Downtown neighborhoods should expect from future institutional development strategies. In 1996, for example, the Yale homebuyers program incentivized housing purchases in Dwight similarly to its current strategy in Dixwell. 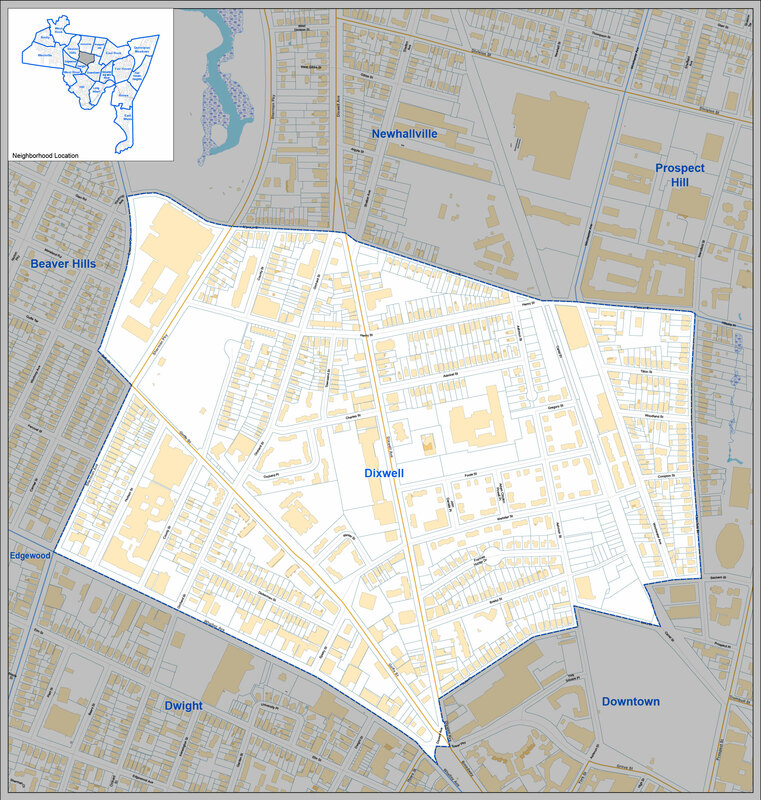 Residents living in Dwight, West River, and the Upper Hill between the Yale-New Haven Hospital and St. Raphael’s, which merged in 2012, might benefit from looking at Yale’s role in the recent changes taking place in the Winfield section of the Dixwell neighborhood. While the gaps between the Core Yale Campus and the Westville Athletic Fields and West Campus in West Haven are likely too large to close with development, the Yale Medical School is within a few short blocks of Yale’s landholdings on Crown Street. Aside from the large and centrally-located campuses of Yale University and Yale-New Haven Hospital, it may be interesting to consider the implications that exist for the institutional expansion of Southern Connecticut State University, University of New Haven, Albertus Magnus College, and Quinnipiac University in Beaver Hills, West Haven, Newhallville, and Hamden. Those schools may lack the endowments, size, and centrality in the region (connected to Downtown only via shuttle service) to wield influence with the magnitude of an institution like Yale University. UConn’s Storrs Center development suggests one pattern for growth outside of an urban center. Anticipating institutional growth patterns while promoting the traditional roles that sites of future development have played in their surrounding communities can encourage more mutually beneficial development strategies for institution and neighborhood alike.